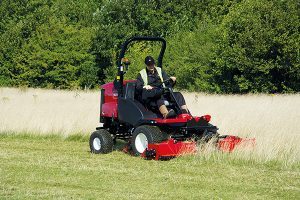 Offering lower operating costs, affordable replacement parts, easy servicing and sheer usability, the LT-F3000 is a unique mower designed to meet the challenges presented by modest budgets and increasing demands of maintaining both short and long grass. Easily tackling the most challenging environments – from the widest open spaces to the narrowest verges – with greater ground contour control, this versatile and easy to use mower makes light work of parklands, roadside verges, housing estate green spaces and other grassed areas. In addition to usability, time and money savings, the LT-F3000 delivers a superior after-cut appearance and is driven by a powerful Kubota 33kW (44.2hp) 4-cylinder diesel engine. “Its advanced blade design delivers unmatched cut quality in all types of grass, and in all types of weather,” says Jeff, who adds that durability is also a key feature in the new model.